Designed as a polishing filter, the denite filter utilizes wood media as the carbon source for the denitrification process and is truly a sustainable solution – no chemical addition required. DESCRIPTION: Integrated Water Services, Inc. (IWS) recently completed the installation and start-up of an onsite water and wastewater treatment system for a newly constructed Travel Center in Oregon which features an advanced denitrification upflow filter to meet low nitrogen discharge limits. The project required a complete wastewater treatment and water treatment system to service the newly constructed travel center on the I-84 corridor on the Columbia River. 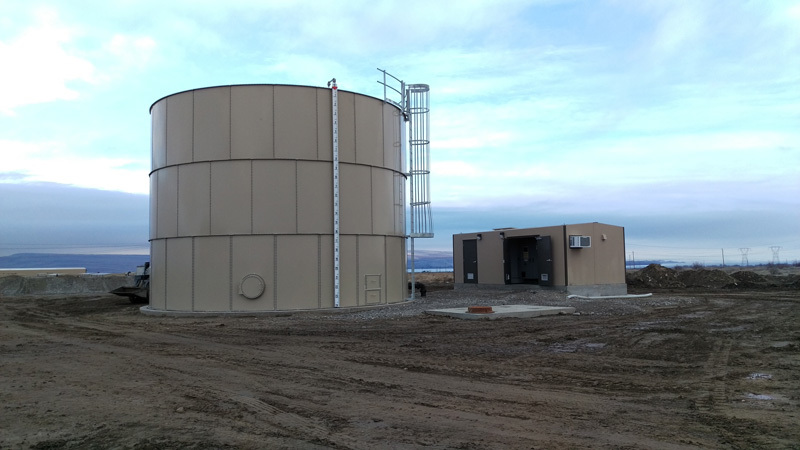 The treatment and process equipment for the project was provided by FexTex Systems, Inc. (www.fextex.com) of Yakima, WA, a leading provider of wastewater equipment and long-time supplier to IWS for the Oregon and Washington market. The wastewater treatment system included the installation of a lift station and pressure piping to the treatment system, three AX-MAX textile filter treatment units (www.orenco.com), a 15k gal Primary Tank, 10k gal Equalization Tank, 15k gal Pre-Anoxic Tank, 10k gal Post-Anoxic Tank, a 10k gal Dosing Tank, a CMU block 50’ by 50’ denitrification upflow filter (www.enrdenite.com), a prefabricated DuraFiber control building, a mounded leach field, security fencing, and all controls for the treatment system. The water system included a 107k gallon above ground water storage tank, a concrete vault to house equipment, a prefabricated DuraFiber booster station building with all associated pumps and controls, fencing, and related electrical and controls. Due to subsurface conditions, a traditional subsurface leachfield was not utilized, rather a mounded system was specified which required the import of over 5,000 tons of spec sand in addition to drain rock. The denitrification upflow filter was supplied by ENR Technologies, LLC (ENR) of Colorado. ENR has a patented single pass upflow filter that denitrifies all the nitrate in the wastewater effluent. Designed as a polishing filter, the denite filter utilizes wood media as the carbon source for the denitrification process and is truly a sustainable solution – no chemical addition required. It is a very simple solution for clients needing to meet low nitrogen limits, requires very little maintenance, and is robust in terms of performance for varying wastewater and operating conditions. The upflow filter can follow any wastewater treatment process that nitrifies, or converts TKN to NO3. The NO3 is then denitrified and nitrogen gas is released into the environment. ENR’s filter consistently removes 95% or more of the nitrate in effluent streams. The technology has been widely used in the Western US and has been accepted by regulators. IWS contracted with Steed Construction, Inc. for the execution of the project. Stantec was the engineer of record for the project.